Structured Cabling is the longest life cycle component of the entire network, outlived only by the building shell. A standards compliant cabling system can "future-proof" your network and guarantee future application support, ensuring that your investment will continue to serve you for the full extent of its lifecycle. GTFS has taken its expertise in providing quality commercial structured cabling solutions, and has developed a reliable, innovative solution for the professional office and residential environment. 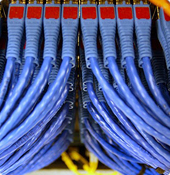 GTFS cabling solution products satisfy the need for a fast, dependable, yet flexible system to accommodate today's changing voice, data and video requirements. Supply of structured cabling materials. GTFS ensure that the installations are fully tested upon completion to ensure all cable meet the standards and test result documents provided by the client. 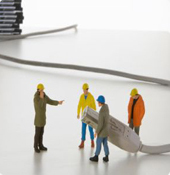 GTFS also provide cable testing and certification service for existing cabling infrastructure. GTFS ensure that the cabling system design, components, and workmanship comply with the standards and practices of BICSI. These standards and practices are elaborated in the Telecommunications Distribution Methods Manual, the EIA/TIA Telecommunications Building Wiring Standard, The National Fire Protection Assn., and the National Electrical Code (NFPA-70). Our technicians are certified on every product installation that we design and are well trained on the industry structured cabling standards. GTFS structured cabling installations are supported by extended warranties that guarantee both end to end performance and application assurance for you.